Close to the border of Lazio, Tuscany's southernmost town resembles a Roman colony during July and August. Albeit not one with gladiators and soldiers, but with Rome's left-wing intelligentsia populating hillside bars and restaurants as much as the deck-chairs along Capalbio's endless beaches. To balance things out, the seaside town Ansedonia a few kilometers up the Tuscan coast has been for decades the holiday destination of choice for the eternal city's right-wing fraction. These days it's hard to say whether this geo-political line of division is still in place - with all the party hopping of Italian politicians it's impossible to discern which side they presently belong to. But whatever the current opinion of political visitors (a class of people also derisively called la casta - the caste), Capalbio's own views have stubbornly stayed the same for centuries. Don't miss out on a walk along the medieval defensive walls (doable with kids too, but keep an eye on them). The views from up here spread over countless olive groves towards the coast with Monte Argentario to the North and the silhouette of isle of Giannutri raising out of the haze at sunset. If you're lucky enough, you may find Capalbio's fortress open for visits. Climb its tower - the modern day 'logo' of the city - and visit the Renaissance apartment Palazzo Collacchioni (see Maremma Tuscany for more info). Shopping: on the way up towards the historic entrance of the town (see map of Capalbio below), you'll pass two lovely shops. Ad Hoc Studio on the right side of the road sells a great selection of sandals, boots, vintage style party dresses and stripy t-shirts for kids (prices reflect the customers hailing from Rome). Qart on the opposite side of the road, artistically restores old furniture - in case you've just bought your very own Tuscan villa. The must see sight for art lovers and people travelling with children is Niki de Saint-Phalle's sculpture park. The French - Canadian artist's colorful Giardino dei Tarocchi (tarot garden) was inspired by the Park Güell in Barcelona. One of Niki's famous large bummed angels (my kind of role model) can also be found on the little square in front of Capalbio's main town gate. 12 € (for details see link above). A great place for a nature walk is Lago di Burano, Italy's oldest WWF oasis. The saline lake behind the dunes of the Tyrrhenian sea is a birdwatcher's paradise from autumn to spring. Flamingos and many more rare species can be observed (rent a pair of binoculars at the park entrance). 7 €uro. Guided visits only! Restaurant bar Il Frantoio is a unusual eatery for a lay-back Tuscan hill top town. The stylishly renovated complex is meeting place for trendy tourists and village dwellers alike. It is also home to a book & clothes shop and an art gallery. You'd think you're in London or Rome, hadn't you read, that you're sitting in a former olive press. On the same square (opposite the main parking area when you arrive from the Aurelia road) is Pizzeria all'Angolo. One of the few wood oven fired pizzerie left in the area. My Tuscan native spent an hour quizzing the pizzaiolo from Naples for the secrets of his dough (flour, water and only the tiniest amount of yeast - the secret lies in preparing the dough at least 8 hours beforehand). So close to the sea, a beach side lunch is a must. My favorite place for devine seafood with a view is restaurant Rosso e Vino alla Dogana. Turn to the left and you are in Lazio, turn to the right and you'll find Camp Capalbio's lovely beach bar - in case all you wanted was a panino. The Roman invasion has led to a wide selection of chic countryside hotels all around Capalbio. But nothing will compare to a house right on the beach. 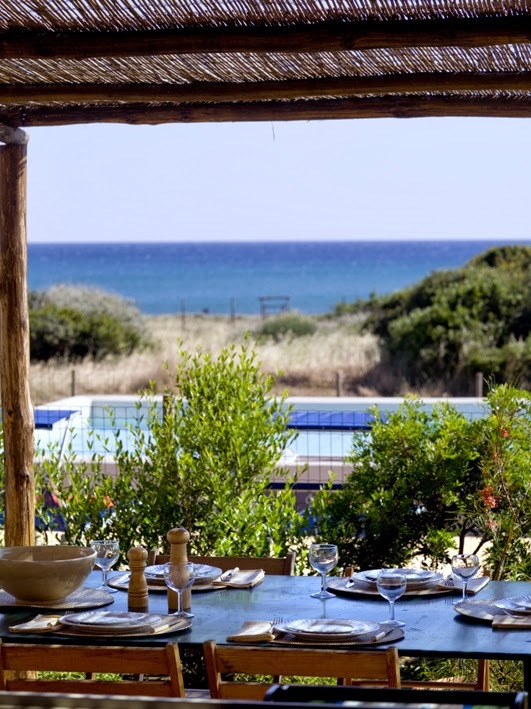 Duna Grande and Duna Piccola are Trust & Travel's fabulous beach side houses with pool 20 minutes to the south of Capalbio. Best avoid the hot and busy high season (July and August) and visit at any point during the remaining ten months of the year. Film aficionados who don't mind the crowd should check out the event calendar of the Capalbio short film festival (every year in July). The Capalbio Scalo train station is a 90 minutes train ride from Rome, in case you plan a weekend break at the sea (Camping Capalbio can organize pick-up at the station).